Ongoing Wish Swap (it goes on) | Stitch, Brinn, Stitch! Pattern: This one from I think I’m gonna purl. 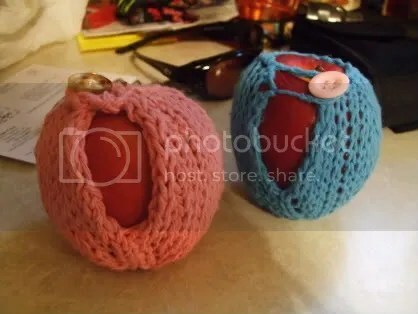 Mods: I made the blue one smaller to fit smaller applies, peaches, and plums. They’re cute! If I ate apples with any regularity, I might make some for myself. I also whipped up some eye/neck/back pillows. They’re filled with rice and a little bit of lavender soap and you can put them in the microwave or the freezer to heat or cool your aches and pains. 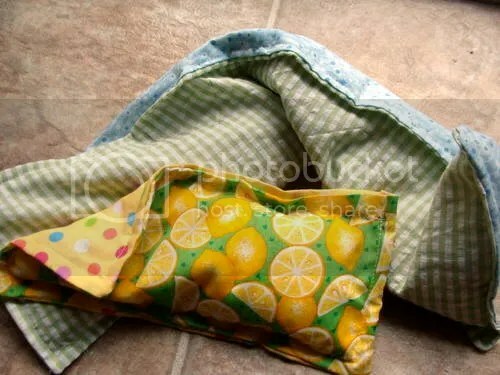 I might make some for myself cause they were so easy and they’re perfect for using up small scraps of fabric (you could quilt them too). The rice is contained in a smaller bag inside the pretty fabric. I used t-shirt scraps because I didn’t want the rice to leak out all over. I really LOVE how these came out and I think they’d also make great gifts, so I’ll definitely be making more. Plus, they’re top-stitched. Everything looks better with top stitching. ALSO, I bothered the iron the fabric, which was basically amazing. I love the iron. I also got my package from the person that claimed me, but as it is at home and I am not, pictures of that will have to wait. I may have other FO’s coming up though, including a tank top.